We are a noteworthy Manufacturer, Exporter and Supplier of Multivitamins Multiminers Antioxidant Methylcobalamin. Our Multi Minerals Tablets are a rich source of essential minerals and are highly effective. 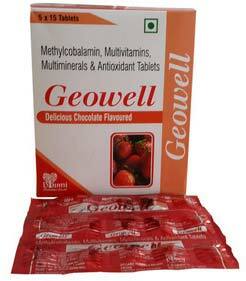 Medically approved and clinically tested, these Tablets are extensively in demand. We make them available in tamper-proof packaging as per the requirements of buyers. Further Details : Offering you a complete choice of products which include Vitamins, Minerals & Nutritional Therapy such as Antioxidants, Multi- Vitamins & Multi Minerals, Multi Vitamin Capsules, and Multivitamins.